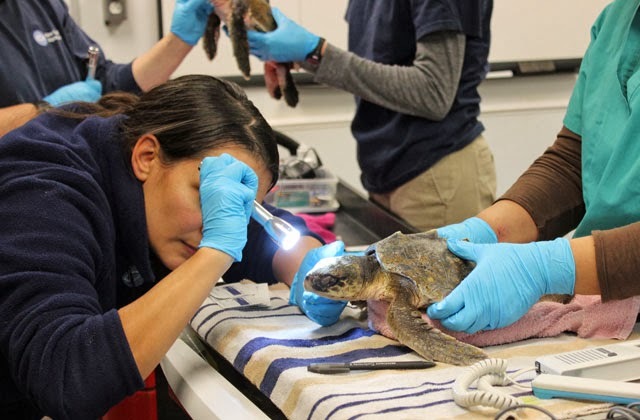 We are now in the midst of rehabilitating endangered sea turtles that washed up on Cape Cod beaches this fall, incapacitated with hypothermia and other ailments. This year beach walkers rescued nearly 90 turtles. 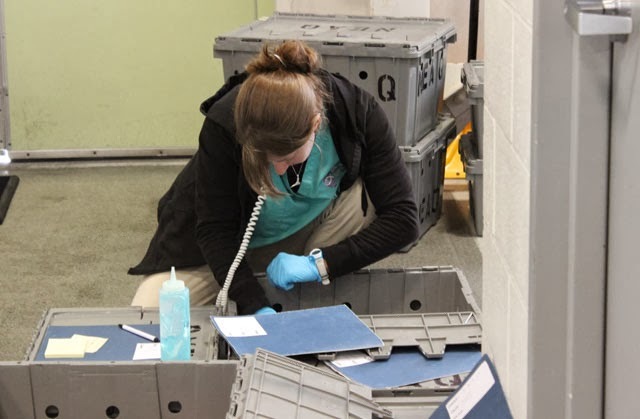 The turtles were treated at the Aquarium's Animal Care Center in Quincy, Mass., and many were moved to partnering rescue facilities to make room for more patients. 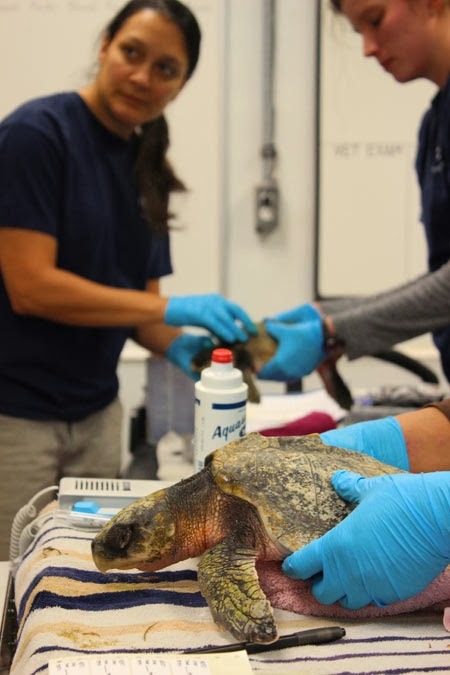 Right now there are more than 40 turtles treatment at the Aquarium's facilities—mostly Kemp's ridley sea turtles and some loggerhead and green sea turtles. This post explains what happens after a turtle arrives from Cape Cod during it's journey to recovery. 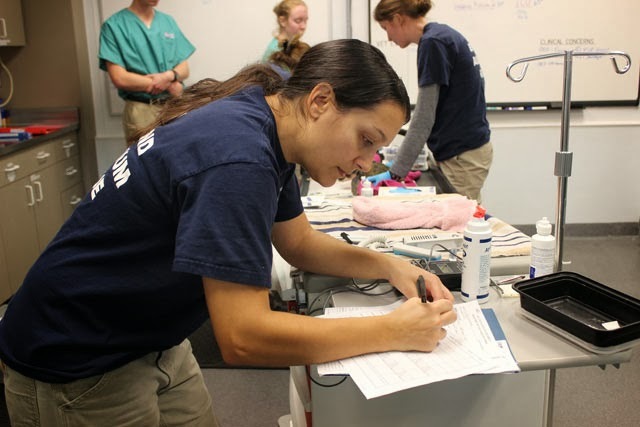 It starts when the volunteer rings the doorbell at the Aquarium's Animal Care Center in Quincy after a long car trip from Cape Cod. The turtles are here! The Rescue Team kicks into high gear with a flurry of staging and organizing. Each turtle arrives in a banana box accompanied by its own medical chart. This chart has basic health assessments such as body temperature and heart rate. Records also indicate the turtle's ID number assigned by NOAA. Rescuers start right in by taking a close look at the charts. Each turtle is assigned an Aquarium number assigned in order of arrival. And then begins the more robust check ups, which includes another check on heart beat and body temperature. An accurate temperature is imperative when calibrating the equipment used for analyzing blood samples. Each turtle is weighed and a small amount of blood is drawn so the rescue team can evaluate blood glucose levels, among other things. The rescue team also examines the turtles appearance, joints, eyes, nose, mouth and throat for any cuts, inflammation or debris. Sometimes the turtles arrive very dirty, so they also get cleaned up a bit. 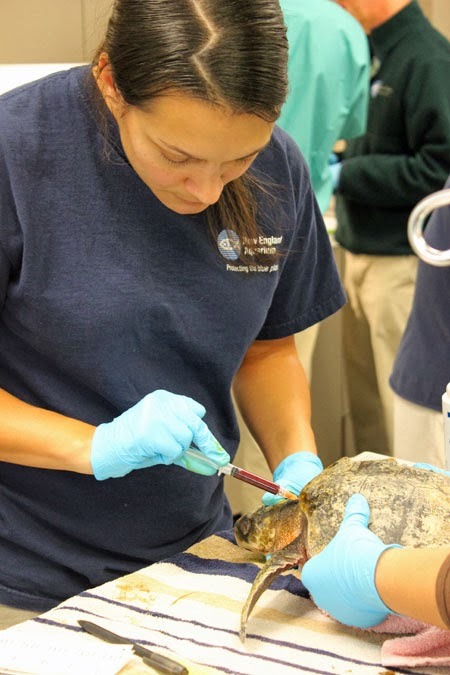 A flashlight helps with careful examination of this turtle's eyes. Katie is looking for abrasions and other irritants. These initial health exams are crucial for telling the care team how to proceed with treatments. Stay tuned to learn of next steps for the turtle patients.